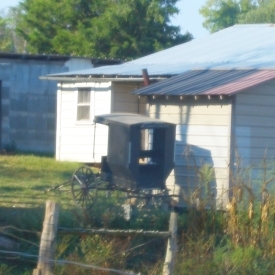 The end of “low” Amish in Kentucky? Here on the blog and on the Amish America Facebook page, some of you have been bringing up the court decision in Kentucky on Slow-Moving-Vehicle (SMV) triangles. The SMV triangle has become iconic of the Amish and the vast majority of them willingly display them on their carriages. However, some of the “lower” groups (in particular the Swartzentruber Amish and a few others) refuse to display them. This refusal has gone back decades, and Swartzentruber Amish have ended up in court on numerous occasions over the matter (see The Amish and the State for a discussion of similar cases going back to the first time an Amishman was cited, in Orange County, Indiana in the late 1960s). A few days ago, members of a Swartzentruber group in Graves County, Kentucky, lost an appeal over non-display of the SMV triangle. On the Graves County, KY Amish post, Al in KY and Lance exchanged comments on the issue. Lance suggests that this could “be the end of low Amish in Ky”. I think that is possible, though there is apparently also the possibility of a Kentucky Supreme Court challenge. There are currently at least 3 Amish settlements in Kentucky that would count among this group (including Hardin County, Kentucky). Amish have moved before over various conflicts with the state, such as over one-room schooling in Nebraska, so it wouldn’t be unprecedented. As to the issue itself, I think when you ask “higher” Amish (ie, standard Old Order, or New Order), you will find folks critical of the Swartzentrubers and others who refuse the SMV, primarily citing safety (not only their own, but that of English drivers). My two cents, if you want them: on the one hand I sympathize with the idea of “leave the Amish alone”–and respect the Swartzentrubers’ sticking to principle. Low Amish see the triangle as a worldly symbol, and feel that the issue of safety rests in large measure in God’s hands. On the other, I tend to be swayed by the safety argument. In lieu of the triangle, some conservative Amish display reflective tape, which I suppose approximates what the SMV triangle is meant to do. But with the SMV triangle so recognizable and widely-used, differing from what drivers expect as the norm could cause confusion in the split seconds when a road decision must be made. And I’m skeptical that reflective tape offers an equally-visible signal as does the bright orange triangle. A good study of the safety aspects and comparative accident rates would be in order, if one hasn’t been done already (buggy safety studies have been conducted, but I’m not aware of one focusing on this particular issue). For more history and background on the controversy, you can try the article “Do all Amish use the SMV triangle?” And for more on Amish in the Bluegrass State, including the “low”, “medium”, and “high” groups, here’s the guide to Amish in Kentucky. We’ll see what happens with this case. But it could well be that Tennessee, Indiana, or any one of other more permissive states will be seeing an influx of conservative Amish in the not-too-distant future. 7 responses to The end of “low” Amish in Kentucky? The triangles might be a good idea if you are out at dusk and beyond. It should not be required, but it is smart to use one, or at least a little tape. I’ve seen people do a triangle outline in tape on various vehicles. Sorry, but they need to either have distinctive running lights or an SMV, especially in fog, bad weather, and after dusk. The most responsible driver in the world is going to find it hard to see a black vehicle on a dark, rainy night. I’ve seen buggies with headlights and taillights and turn signals; so I know it isn’t impossible to engineer – but acceptance is a different matter. Where it can get very dangerous is in an area like ours where thousands of buggies are equipped with SMV triangles, lights & turn signals then you get Swartzentruber buggies mixed in without triangles or lights so a driver might be driving down the road and think he/ she knows what to watch out for then BANG — there is an unlit buggy without a triangle. But the bible tells us to obey our government. Are not the Amish leaders in conflict with scripture by not being obedient? Most Amish do not see the use of the SMV as going against the commands of God. However when they first came into usage in Ontario, I thought they certainly did not look modest on an otherwise black buggy. Amish are Christian, not Jewish. Leave a reply to The end of “low” Amish in Kentucky?